TERN controllers are designed to offer a rich array of I/O, but experienced embedded engineers know you can never have enough. TERN’s i2x I/O expanders are intended to solve this problem once and for all by providing a low cost, simple, reliable, and nearly limitless expansion for TERN controllers. TERN’s i2x product line adds an unprecedented degree of flexibility to your application design. TERN i2x I/O expansion is designed around an i2c-compatible bus. The bus is driven by only two host TTL signals: one output line acting as clock, and one bi-directional I/O acting as data. This allows a TERN controller, with its many tens of TTL I/O lines, to control numerous buses at a single time (even better since the data line can be shared by multiple buses). Each bus, with its integrated support for node addressing, can further support up to 16 remote node addresses used to control and communicate with remote i2x expanders. The expanders can be addressed at a maximum rate of approximately 1 KHz; Expander I/O lines can sink up to 25 mA each, making it useful for driving LEDs, lights, or even small relays. All remote i2x nodes must be used within 5 meters of the host controller. The i2x network consists of up to 5 physical wires: CLK, GND, 5V, DAT, INT (optional). Each i2x expander device has the same standard 5-pin header for easy wiring. software drivers and sample programs. TERN81S: 8 white Segment-Digits on blue background. These LCDs have a large font, are impressive looking and easy to use. The display text can be clearly see from 15 feet away. 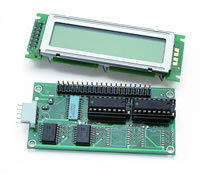 The KP is a simple user interface solution supporting a LCD display (16×2 character LCD by default, or 132×32 graphics LCD), and 8×2 dome keys occupying two i2x node addresses. The keys are covered by a blue color plastic overlay with clear windows, allowing the user to use custom key legends. voltage inputs, and 2 mechanical relays can be installed (requires additional i2x node addresses). The KP can be powered by 9-12V unregulated DC with on-board 5V regulator or powered with a regulated 5V DC power. The very small foot-print D32 occupies four i2x node addresses, and can provide an 32 I/O lines. It also supports a character/graphics LCD. It has 14 hardware configurable high voltage I/Os, capable handling upto 30V DC. two normal open contacts. These relays are capable of far higher switching speed when compared to standard electro-mechanical relays. Each output is specified to support a maximum of 200 V, 1 Amp peak current, 0.5 Amp switching current; each output is also rated for up to 100 million switches.